This webpage provides an overview of Working Groups (WGs) (see “Creating or joining an RDA Working Group”), Interest Groups (IGs) (see “Creating or joining an RDA Interest Group”), Birds of a Feather (BoFs) (see “Creating or joining a Birds of a Feather Group”), Working Group Processes, Interest Group Processes, Charters, and Case Statements. Please note that the documents herein are a work in progress. We want people to work through these guidelines and to provide constructive feedback on their usefulness. Please contact us with your feedback. The Research Data Alliance accomplishes its mission primarily through two important mechanisms: (1) Working Groups; and (2) Interest Groups. A third mechanism are short-term (3) BoFs held at plenaries, which can lead to new Interest or Working Groups. 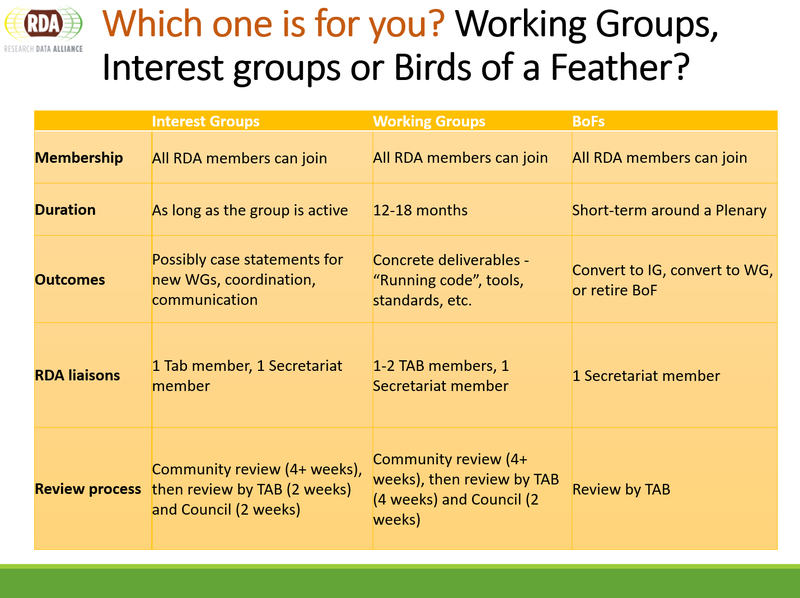 Any RDA member may initiate or join an RDA Working Group, Interest Group, or Birds of a Feather. To become a member of the RDA, individuals should register with the RDA online community, thereby affirming their support for the RDA Guiding Principles. RDA works to implement functional infrastructure through Working Groups which are comprised of experts from the international community engaged in creating deliverables that will directly enable data sharing, exchange, or interoperability. Working Groups conduct short-lived, 18 month efforts that implement specific tools, code, best practices, standards, etc. at multiple institutions. For more detail on the expected WG outcomes, see Working Group Outputs. Birds of a Feather groups (BoFs) are formed to hold one-time meetings at RDA bi-annual plenary meetings. The aim of a BoF session is to find other RDA members interested in the topic, and to explore whether there is interest in establishing an Interest or Working Group on the topic. For more details see Creating or Joining a Birds of a Feather Group.